Byres Road design events – your invitation! Your invitation – please share! Since the launch event on 23 February, we’ve been busy with technical surveys and initial design work for the redesign of Byres Road. A series of public events will be taking place in August to share different options. Everybody is welcome – we need input from as many people as possible to guide us to the right solution. Please come. And please share this invitation! More information in the flyer and text below…. There’s a new Byres Road coming… funding of £9m has been allocated through the Glasgow City Region Deal to make Byres Road a great place to be. Work will start on the ground in late 2018. We have until then to do the design work – with public input – and get the necessary consents in place. During August 2017 there will be a series of design events where we’ll share different options to balance pedestrians, cyclists, buses and traffic — and to make Byres Road a better place for everybody. This is everyone’s opportunity to reshape Byres Road as a world-class street for businesses, residents and visitors. Come and have your say. Drop-in design days on 14-16 August are our big focus. Initial design options will be on display, with the design team there to hear your thoughts. This is your opportunity to shape the future of the street! Inclusive design workshop on Monday 7 August is specifically for disabled people, elderly people and those with long term health conditions. It will be held in an accessible West End venue on Monday 7 August. Please book in advance via Glasgow Disability Alliance: admin@gdaonline.co.uk or 0141 556 7103.
Business breakfast on Tuesday 15 August is for anybody who runs or works in a business on or near Byres Road. Drop in between 8am and 10am for a chat with the design team – we’ll be at The Hill, 94 Byres Road. Help shape the proposals so that they are good for business! To find out more about the project…. Check out the exhibitions in Hillhead and Partick Libraries for more information. Facebook.com/ByresRoadCorners has lots of informative posts and debate. Contact us direct at byresroadcorners@gmail.com or 07900 334110. Give your view, 20mph, Borders rail corridor, Air Quality and more …. Your view is important. 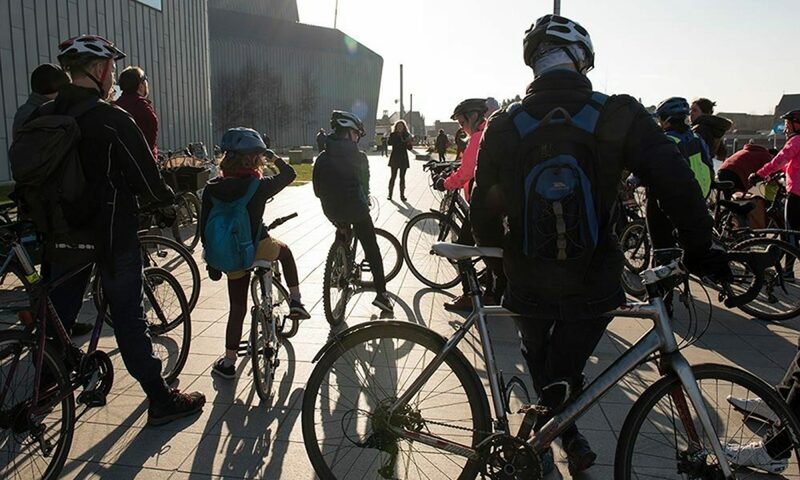 GoBike is a member of Transform Scotland, a body that campaigns for public and active travel and they have sent out this list of current consultations – all of which impinge on those of us who cycle. If you haven’t already, then please do give your views on them all. Mark Ruskell MSP is proposing a Bill to be put forward in the Scottish Parliament to make 20mph the default speed limit in urban areas. There is now a consultation on this proposed Bill, which aims to gather the opinion of the public on a default 20mph speed limit. You can share your views by filling out this survey. To read about the benefits of 20mph limits, please see here. Transport Scotland are welcoming comments from members of the public and organisations on future transport developments in the Scottish Borders. Chief among the priorities for the Borders should be extending the Borders Railway beyond Tweedbank. We would also encourage people to call for support for bus services in the Borders; and better infrastructure for cycling on key routes in the Borders. Views can be submitted here. The Parliament’s Environment, Climate Change and Land Reform (ECCLR) Committee have launched a public consultation on air quality in Scotland. The Committee are keen to hear about a range of issues relating to air quality, more information on which can be found here. To see the consultation and respond, please visit the Committee’s consultation page. The Scottish Government is proposing a 50% reduction in ADT by the end of the current session of the Scottish Parliament and also abolishing the tax in the future. The Government has launched two public consultations on ADT relating to the overall policy, and the environmental impact of the policy. To read the consultation and respond, see here. To read one of our recent briefings outlining our position on a cut to ADT, please see here. The Scottish Government has launched a consultation on the new Climate Change Bill. Proposals include setting targets based on actual emissions, increasing the 2050 target to 90% emissions reduction, and making provisions for a net-zero greenhouse gas emissions target to be set. The Bill itself makes technical changes, but does not focus on specific policies — this leaves the risk of little action being taken to tackle transport emissions. To read and respond to the consultation, please see here. Stop Climate Chaos Scotland have also prepared a response that people can sign and send to the Scottish Government. To see this and add your name, see here.